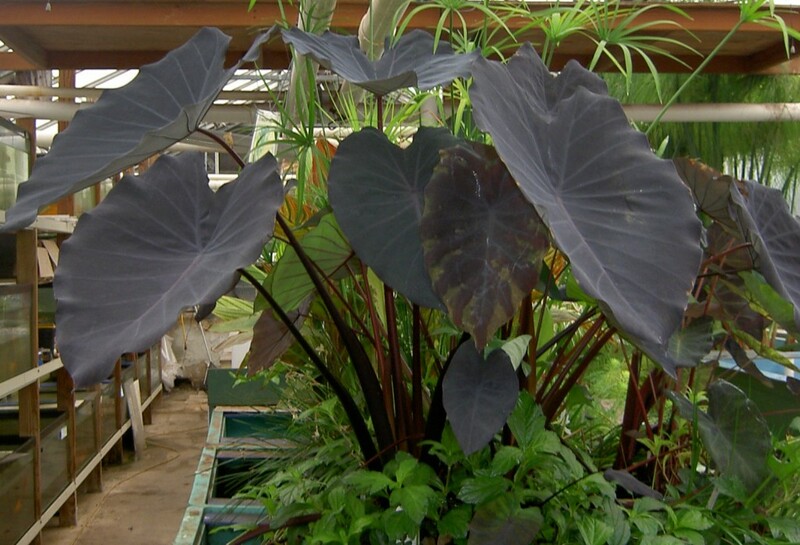 Taro or Elephant Ear plants are a great addition to any water garden due to their variety and foliage. They come in various colors and sizes and they not only provide some shade to ponds but enhances the natural look. Taro is an emergent plant with broad leaves that resemble elephant ears that are natural to tropical regions. In colder regions, this plant should be taken indoors as they will not be able to withstand extreme cold. They can be planted in pots with the water level just an inch or two below the top of the container. Black Magic, which are deep purple and often confused with black. Their leaves can grow up to 3 feet and take partial shade. Their unique color adds variety to the usually green foliage of other pond plants. Nancy’s Revenge, which has a white center and can grow up to 3 feet. Green Taro, which also grows up to 3 feet under ideal conditions and it is often called Elephant Ear. Ruffles Taro, as the name implies has green leaves that are ruffled. Imperial Taro has dark green leaves that have the look of very light green to white veins on them. Harlequin Taro is the larger of all Taro plants by growing up to 8 feet. This plant will do well in partial or full shade and should be planted only in larger ponds.